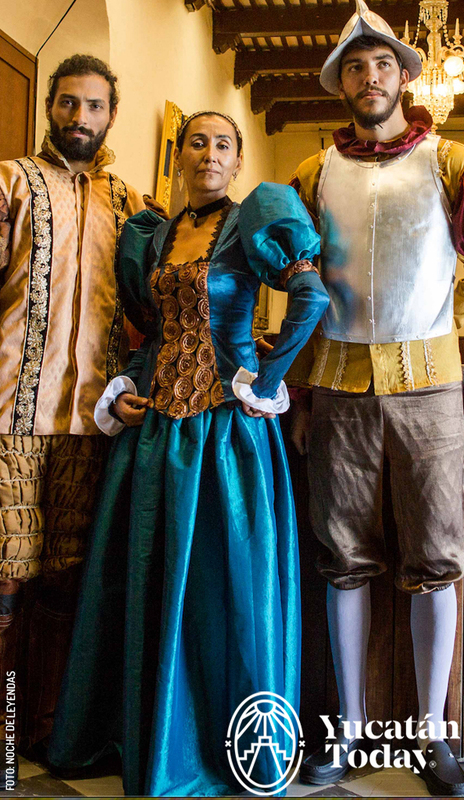 Humorous, exciting and historically accurate scenes depicting the Conquest, the founding of Mérida, and other episodes of the Viceroyalty period: you can expect all this, and more, at the Noche de Leyendas in Mérida. It’s 9 pm and I am sitting on the sidewalk outside the Teatro José Peón Contreras with the other attendees while we wait for the show to begin. Families, couples, tourists, and even pets were welcomed by a narrator dressed in period attire and an accompanying harlequin. Our magical visit through downtown Mérida kicked off with stories of the University (UADY) building and the Parque de Santa Lucia, as well as anecdotes and laughter coming from the characters and the crowd. We make a stop at Parque Hidalgo to commemorate our Maya ancestors, and then we continue our itinerary to the Catedral de San Ildefonso. One of the most important chapters of Yucatán’s history is represented in the atrium of the cathedral: the evangelization of the Maya people and the burning of their codices. Lit torches (don’t worry, they’re under control!) add dramatic flair to the scene. We continue towards City Hall for the representation of the founding of Mérida. By this point, we are completely immersed in our journey to the past and ready to explore the underground alleys across the street. Only Noche de Leyendas has access to these tunnels, and the mix of intrigue and humor make the experience both mysterious, and surprising. Nothing to fear! The last stop of this hour and a half long tour is the former Convento Monjas which currently houses the Casa de la Cultura. As we stand together in the dark, we listen to the story of Dolores, a nun from the Order of the Immaculate Conception; among other related stories. At the end, the group of attendees and actors takes a picture together and we finish our fun evening learning about the Centro Histórico’s history. 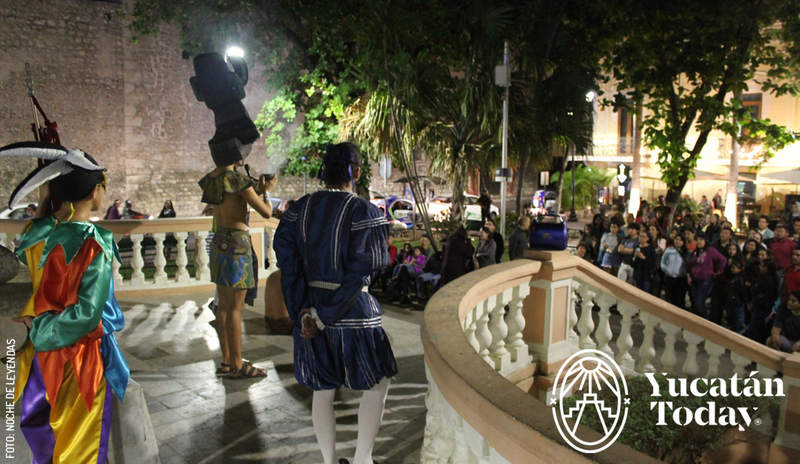 This cultural activity is great for locals and tourists alike. The event is under the direction of Maricruz Hernández, who also wrote the screenplay. Noche de Leyendas Mérida will be celebrating nine years of theater representations this March. The performances are in Spanish.